This simple Dutch Salad is the perfect side to a flavorful meal. It’s delicious and refreshing, but not complicated at all, so it pairs well with things like a marinated, grilled steak, spicy chicken wings, or other dishes where you really want the flavor to shine. A Trim Healthy Mama-friendly S, you can enjoy this salad as is, or use it as a base for a pile of non-starchy vegetables, bacon, and seeds. The sweet and tangy dressing is so delicious, you might find yourself tempted to drink it! It’s made from a bit of mayo, Dijon mustard, white vinegar, sweetener (I used xylitol, but you could use Gentle Sweet in half the amount), sea salt and ground pepper. My favorite method for hard-boiling eggs is to place the eggs is a saucepan and cover them with cold water. Bring the water to a boil over medium-high heat, put on the lid, remove from heat, and let the eggs sit for 8-10 minutes in the hot water to finish cooking. As soon as the time is up, drain out the hot water and rinse the eggs in freezing cold water to finish the cooking process. Store the eggs in the fridge until they are cold enough to handle. Peel and chop! (Old eggs are much easier to peel than fresh). Traditionally, Dutch salad is made with either iceberg or butter lettuce because they are mildly flavored, but darker leaves like Romaine or chard are more nutritious, so you can use those or a mix instead, if you prefer. You can also use the dressing to pour over a peeled and sliced cucumber for a wonderful cucumber salad. 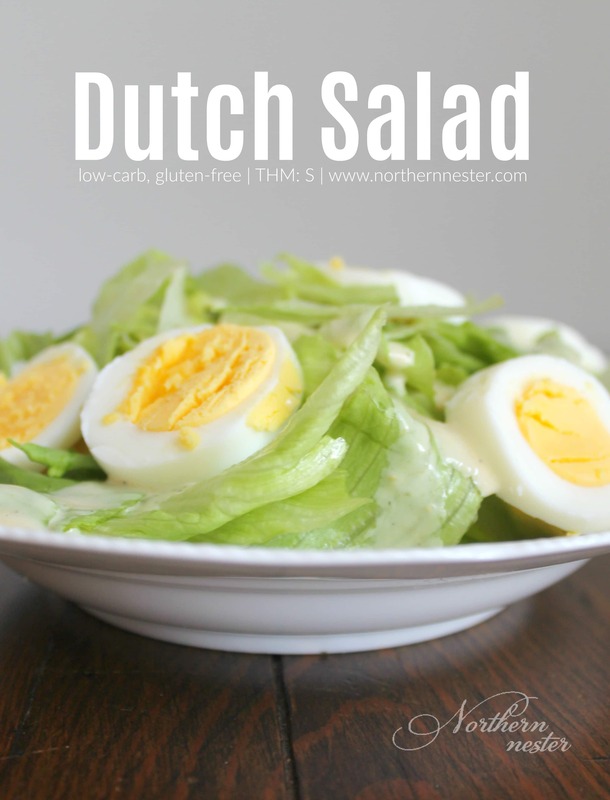 This incredibly simple Dutch Salad is a frugal side for savory THM S dishes where you don't want a lot of competing flavor. Or, load it up with non-starchy vegetables and turn it into your main meal! Rip or cut of the head of lettuce and put it in a large bowl. Peel and chop up the hard boiled eggs. Sprinkle over lettuce. Whisk mayo, sweetener, mustard, vinegar, and pepper together in a small bowl. Pour over lettuce and eggs. Stir to coat. Serve immediately. Looking for more Trim Healthy Mama-friendly Dutch recipes? This low-carb Boterkoek is a favorite in our house! This looks simple, yet delicious. I’m interested in your Spicy Chicken Wing recipe!